An elephant has learnt to speak Korean. 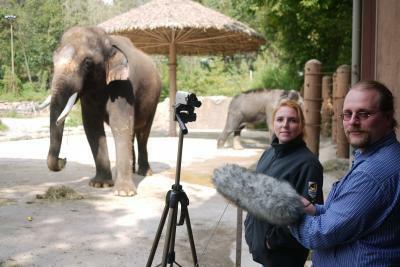 The Asian elephant, called Koshik, lives at the Everland Zoo in South Korea and can imitate human speech that can be easily understood by people who know the language. Koshik’s vocabulary only exists of 5 words at the moment but the elephant’s language skills may provide vital insight into language and vocal development. Koshik the asian elephant manages to copy human words by putting his truck in his mouth. Elephants don’t have lips – only a trunk. Their large larynx can produce very low-pitched sounds, but incredibly Koshik’s speech mimicry exactly copies the pitch of his human trainers’ voices. The elephant’s five word vocabulary is – “annyong” (“hello”), “anja” (“sit down”), “aniya” (“no”), “nuo” (“lie down”), and “choah” (“good”) – according to a report on November 1 in the science journal Current Biology. In the past there have been reports of both Asaian and African elephants mimicking sounds. African elephants have been known to imitate the sound of truck engines, and a male Asian elephant living in a zoo in Kazakhstan was said to produce utterances in both Russian and Kazakh, but that case was never scientifically investigated.